As I was researching various cable providers I noticed a lot of them refer to their products as satisfying their customers' "entertainment needs". I don't really think entertainment is a need-my body doesn't need entertainment to live-but I do feel I've grown up conditioned to expect music in the air and moving pictures on screens wherever I go. Maybe the cable companies should reword their pitches to replace "entertainment needs" with "entertainment expectations". Or maybe I'm just uncomfortable with how right they really are. Considering how freaked out I get by absolute silence maybe it should read "entertainment addictions". The other night for my wife's birthday we went to go see the Disney Princesses on ice show and holy hell was that like being force fed fried chupacabra nards. But I was smart and I smuggled in a copy of the weekly entertainment tabloid newspaper to read and I found something to chew on. 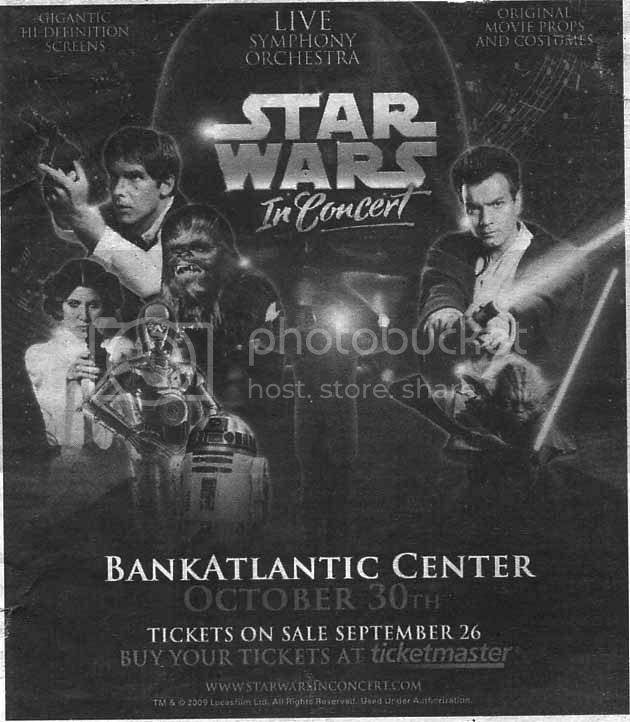 I may be deficient in vitamin R2-D2 but there's going to be a stop in Miami on the Star Wars in Concert tour. I didn't think they were coming here because it wasn't on the list at their website so I got excited. Attending this will be like a four course Thanksgiving feast served by C-3PO himself. Star Wars concert-it won't just be good, it'll be good FOR me.